A buoyant, breathtaking poem from Juan Felipe Herrera — brilliantly illustrated by Caldecott Honoree Lauren Castillo — speaks to every dreaming heart. Have you ever imagined what you might be when you grow up? When he was very young, Juan Felipe Herrera picked chamomile flowers in windy fields and let tadpoles swim across his hands in a creek. He slept outside and learned to say good-bye to his amiguitos each time his family moved to a new town. He went to school and taught himself to read and write English and filled paper pads with rivers of ink as he walked down the street after school. And when he grew up, he became the United States Poet Laureate and read his poems aloud on the steps of the Library of Congress. If he could do all of that . . . what could you do? 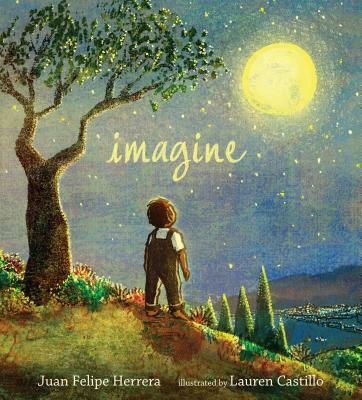 With this illustrated poem of endless possibility, Juan Felipe Herrera and Lauren Castillo breathe magic into the hopes and dreams of readers searching for their place in life. Juan Felipe Herrera is a poet, performance artist, and activist. The son of migrant farmworkers, he was the U.S. Poet Laureate from 2015–2017. He has published more than a dozen collections of poetry and is the author-illustrator of Jabberwalking. He lives in Fresno, California. Lauren Castillo has illustrated many books for children, including Happy Like Soccer by Maribeth Boelts and Yard Sale by Eve Bunting. Lauren Castillo is also the author-illustrator of the Caldecott Honor–winning book Nana in the City. She lives in Harrisburg, Pennsylvania. Lauren Castillo’s perfect illustrations — warm, deftly composed, with the sensual allure of woodcuts—are so captivating they might on their own overcome a ho-hum story. But this poem is a masterly picture book text: Its precisely chosen words create a world you have to listen to, to think about. When at the end you learn that you were being told this boy’s story as a spur to your own potentially amazing one, the surprise and the gratification outweigh any sense of a lesson being taught. Castillo's ink and foam monoprint illustrations are a tender accompaniment to Herrera's verse, the black lines of her illustrations flowing across the page in rhythm with the author's poetry. Together this makes for a charming read-aloud for groups or a child snuggled in a lap. A lyrical coming-of-age story in picture-book form that begs to be shared. Written by the master wordsmith himself, this work details Herrera’s life as a young boy spending time outside and then as an adolescent learning to craft poetry, before ultimately receiving the honor of U.S. Poet Laureate as an adult. His words are accompanied by pen-and-foam monoprint illustrations that sweep across the page to create a soft, dreamy feeling, further encouraging readers to heed the author’s recurring refrain: imagine. Readers will finish the story envisioning all the possibilities that may await them. A beautifully illustrated poem that will be cherished by children. A first purchase. With solid storytelling and evocative detail, Herrera invites youngsters to relate to his own experiences, making this a more grounded outing than many exhortations to young audiences. Castillo’s art cleverly employs pencil and foam monoprint to contrast the assured, homey linework that anchors the figures with the dappled textures of light and color in the backgrounds, representing both the creative and the earthbound sides of the experience. The result is an inviting literary extended hand, beckoning young people, especially those who might find their current situation unprepossessing, to connect the dots with their own future possibilities. Herrera’s talents of speaking, singing, playing music, and writing poetry are inspiring. This quiet tale may motivate readers to reflect on their abilities, and allow their imaginations to envision the opportunities that await them. Even as former U.S. Poet Laureate Juan Felipe Herrera traces the surprising trajectory of his own life, his breathtakingly beautiful poem invites us all to dream and to imagine that even the most unlikeliest of dreams might come true...The gorgeous illustrations "in pen and foam monoprint" by Lauren Castillo, winner of Caldecott Honors for "Nana in the City," beautifully capture the emotion and the dreamy quality of the story. Filled with vivid imagery (the “milky light” from the moon that shines on the boy’s blanket as he sleeps outside, the “silvery bucket” he carries for fetching water) and Lauren Castillo’s highly textured, earth-toned illustrations rendered via foam monoprint, Imagine is a tender story that is brimming with hope.